← New Wire Anchor Strops! Man baskets are an excellent way of accessing high and hard to reach places. They offer a workspace that can be easily lifted into the air to allow workers to complete tasks at height, while their sides ensure the worker is safe and secure at all times. At SafetyLiftinGear we offer man baskets that can be crane slung or lifted using a forklift depending on the equipment you have available. We have a man basket hire service that can be used when you only need a man basket for a one-off job, or for a short period of time. This man basket is a very popular choice for high-level access. It features overhead protection, and an inward opening door, an overhead harness point and an internal handrail. This man basket works with either a crane or a forklift, making it an incredibly versatile option. This man basket features overhead protection, a high solid wall, an inward opening door and an internal handrail. It is also supplied with a large tool tray. 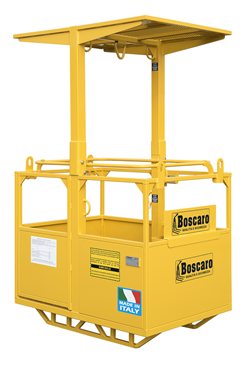 This man basket can only be used with a crane, and is therefore fitted with a secure 4-leg chain sling. Both of these man baskets are available to hire & the process of hiring either of them is easy. 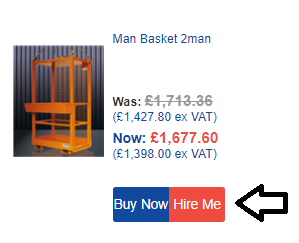 First, click the ‘Hire Me’ button next to your chosen man basket then head to the checkout. Follow the on-screen instructions to complete your order and get your man basket hire quote!